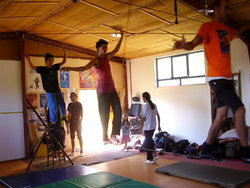 A specific workshop which offers the possibility to experiment the sense of balance through the practice of walking on the tightrope. Following a didactic pattern which focalizes attention on body awareness, posture, contact with the ground and surrounding space, we will try to higher consciousness of the energetic flow in the body in order to maintain the balance in such a difficult situation as on the tightrope. Particular interest will be put on the work of preparation. After the first part of preparation on the ground every participant will have the chance to experiment himself individually on the cable. With the acquisition of the fundamental principles and a certain level of security, it will be possible to enlarge the range of movements and to introduce variations such as running, jumping and work with objects. In the end the temptation will be to achieve free expression of movement on the tight rope, nonetheless the range of freedom and expansion on the cable is very restricted. The workshop is aimed at adolescents and young adults, artists and non, but it suits perfectly well also children and grown-ups. In preparation the basic principles of Tai Chi Chuan and Qi Gong will be introduced. The working sections will be divided into 3 hours each. Each participant will have to provide for himself proper shoes with thin soles (dance/ gymnastics). While structures for the tight rope (height 50 cm) and mattresses to ensure safety of the participants will be provided by the teacher. Other for who is interested in circus skills, the workshop is particularly interesting for theatre groups and dance companies, willing to enrich their experience. Nonetheless it is also of great value to who never has practiced sport or movement, given the clear simplicity of the task and the great satisfaction at its conquest.